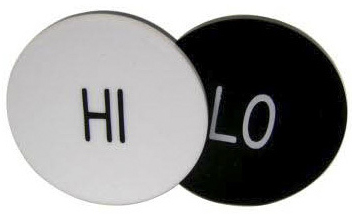 Here is our HI-LO Puck - 2 inch x 1/4 inch printed on both sides We have a large assortment of 2 inch by 1/4 inch thick plastic, chip-shaped poker pucks are printed on both sides. They are used to denote an action or inaction of a poker player on one or more of the bets the player is currently making or general information like the player position in relation to where the player is sitting to the dealer puck. See our other lammers for dice and our larger 3 inch pucks.